It is so comforting to make burgers with an agitated mind! The hands are moving almost automatically; the brain knows what nice things to do out of flour, milk, egg, butter, and yeast and a somewhat odd looking piece of transverse rib, while the thoughts are actually distracted completely. They are far away, still so lost in reverie and concerned with the impressions just experienced. The feelings do not care at all about the fact that it was not real and „just an anime series“ which you almost inhaled during the past hours: The head is still full with the pictures, filled with the music, and the impact. The heart is still racing and also feels a bit numb. The thoughts are in uproar, while I almost feel a little sad because it is over and I had to leave that world… So they really still exist, those gripping TV-series, that just won’t let you go and that achieve to really bother you deep down! Even if you have to look at the subtitles for understanding everything. And well, because the head is still running in Japanese a bit, I make the burgers Japanese-style as well. Almost without realizing I grab the miso paste, the wasabi and the mayonnaise while all these pictures are still dancing their circles in my head. Indeed: How very comforting it is to cook something delicious while absorbed in thought! And at last the first bite into the freshly made burger finally makes me able to shake off the last goosebumps and lets me grin happily again. 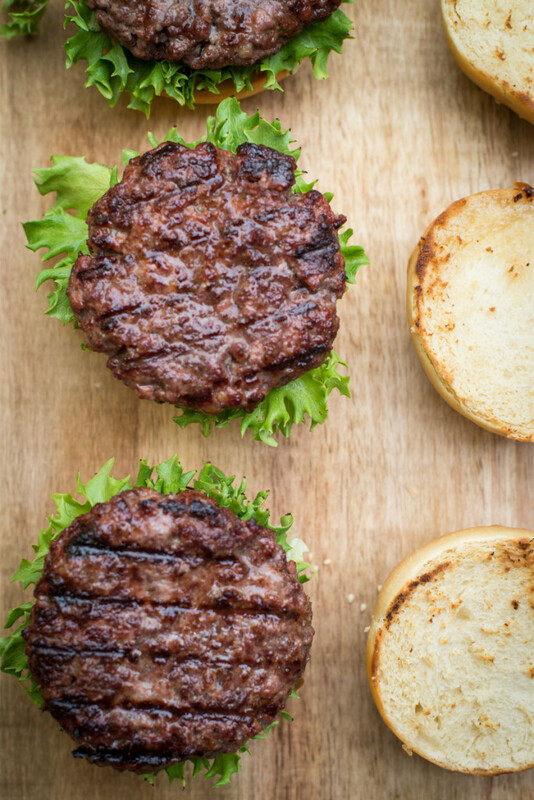 To prepare the patties cut the beef in stripes in the size of your small finger. Mix about one third of the meat with the salt in a bowl, mix the other two thirds with the miso paste in another bowl. Cover each bowl and put them in the fridge for at least 4 hours (and start with the buns during that time). Put the salted beef into a meat grinder and mince it with the rough slice of the meat grinder. Mix it with the miso beef and mince it one more time. Divide into 4 equal parts and form patties with your hands. 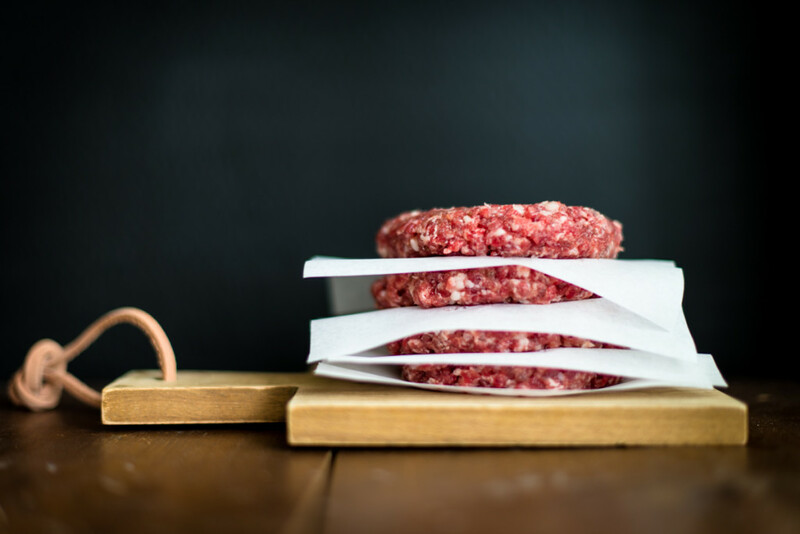 If you don’t have a meat grinder at home just buy the minced beef and mix it with salt and with the miso in the same amounts and store that in the fridge for at least 4 hours before mixing both parts together and forming the patties. To make the brioche buns warm up the milk with the sugar in a small pot until it is lukewarm. Switch off the stove. Add the yeast to the milk and stir until it has dissolved completely. Let it rest for 15-30 minutes. Pour the mixture into a bowl and add the wheat flour, the salt, the butter, and the egg. Knead until you have a smooth, sticky dough, that is still wet. Generously dust a working surface with the additional flour and keep on kneading the dough with the flour until it just is not wet and sticky anymore. Put it back into the bowl, cover it, and let the yeast work for 2 hours. Cut the dough in 4 equal parts, knead them shortly, and form them into balls. Let them rest under a clean, dry kitchen towel for additional 30 minutes. Meanwhile preheat the oven to 200°C. Carefully put the buns on a baking tray with baking paper. Whisk up the last egg and brush it on the buns. Sprinkle a little sesame over them and bake for 15 minutes. For the 5 minute gherkins cut the cucumber into 1 mm thick slices and put them in a pan, together with the other ingredients. Heat them up and let everything cook until the cucumber slices are soft. Remove the pan from the stove and let the gherkins cool down to room temperature. For mixing the wasabi mayonnaise simply season the mayonnaise with as much wasabi paste as you like. 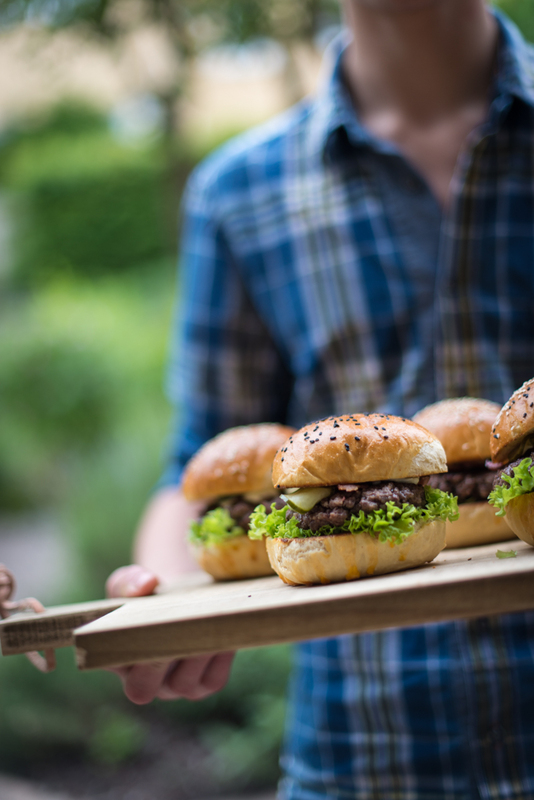 Frying and finishing the burgers: Let the patties reach room temperature before you cook them. Heat up a pan, half the buns, and roast them until they are nicely browned and have a crispy surface. Then fry the bacon until crispy and put it aside. 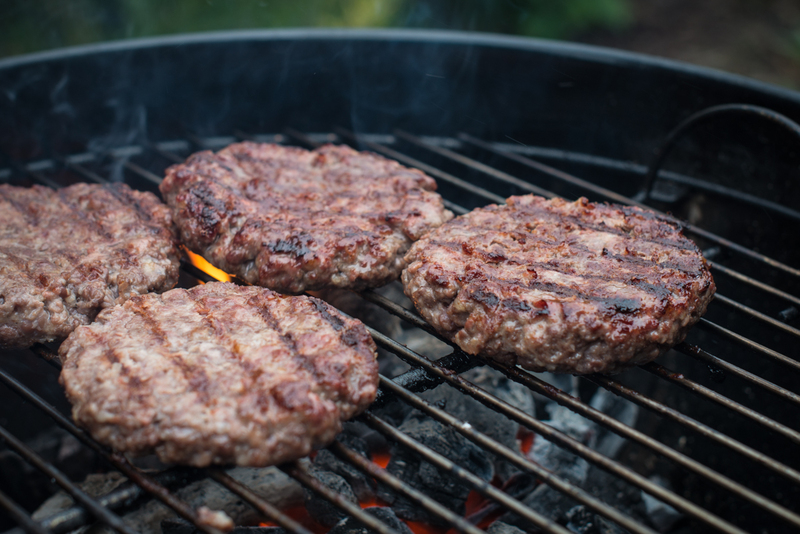 Fry the patties for 3 minutes in the bacon fat, then turn them over, and fry for 2 more minutes – or put them on a grill for the same time on each side. 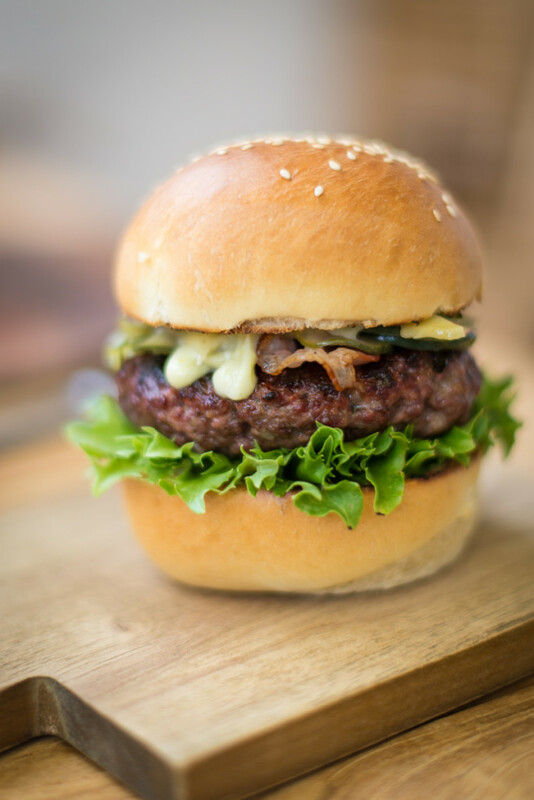 Spread a little of the wasabi mayonnaise onto each bottom part of a burger brioche bun, add a salad leaf, then one patty, bacon, gherkins, more mayonnaise, some gari and finally another salad leaf before topping it with the top part of the bun. Dig in!